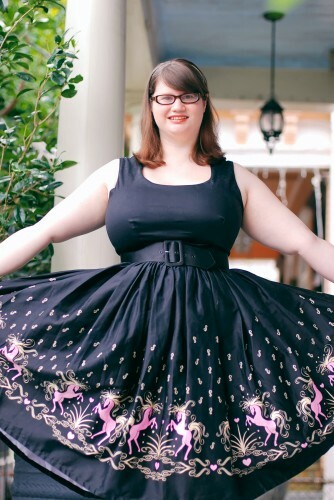 Pinup Girl Clothing is known for their bold prints, but their new ‘Fairytale Fantasy’ inspired range turned into a major online fashion release. 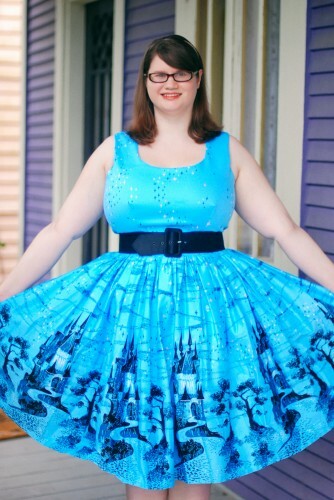 Since I’ve never met a loud novelty print I didn’t love, I had to get my hands on one of these dresses. What I didn’t expect was that I loved the shape so much that I grabbed a second one! Thankfully, Pinup Girl Clothing managed to replenish their stock recently so you can still get your hands on one of these great dresses. Loud prints aren’t for everyone and Disney prints aren’t for everyone, so I suspect these are dresses that you’ll either love or hate on sight. While I love the Disney print versions, the dress shape is the real star of this show. I hope that Pinup Girl Clothing will release it eventually in plain colors or in a design that isn’t so polarizing so everyone is tempted to try it, because it deserves to join their regular dress line. The design is ballet influenced and has a great 1950’s feel; if Audrey Hepburn did Disney this is what it would look like. A thick satin lining helps create a great shape in the bodice and the pleats are sewn in with industrial strength – if you’re between sizes, go up rather than down. 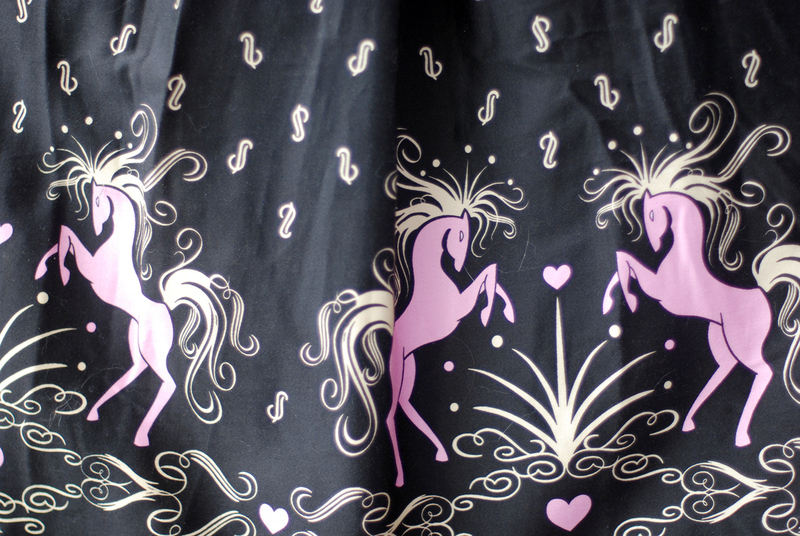 The print features beautiful pink horses that remind me of old fashioned carousels. If you’re not sure about whether the whole Disney print thing will work for you, this Dancing Horses print is a nice general wardrobe option. I loved the first dress I got so much that I picked up a second one in the hotly anticipated castle print. 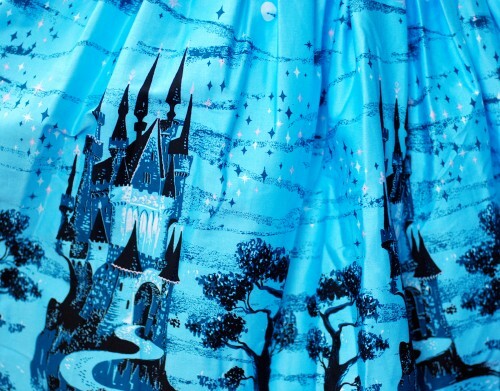 This is definitely an obviously Disney influenced print and makes a statement – it’s also a really pretty dress and creates a great shape, so I can see wearing it a lot without feeling too princessy. That said, if you want a Cinderella costume for Halloween this dress could go that way as well with some themed accessories. 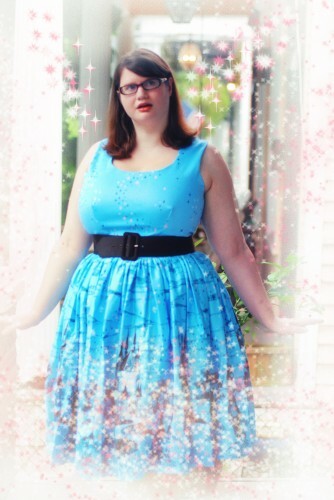 Since these dresses are pretty loud, I tend to pair them with plain black shoes and fairly light makeup. I love that you can dress them up or down as well by swapping out different jewelry and shoes. The blue color is lovely and the print is really lush. I’d recommend these dresses to anyone looking for a statement piece (and of course any fans of Disney princesses!). Omg, so cute! Love the cute little effects you added. Those dresses look lovely. Great review! I’m hoping to get the Blue Aurora Dress soon.